A peace conference in Paris opens after the end of the Crimean War. The Congress of Paris worked out the final terms from 25 February to 30 March 1856. 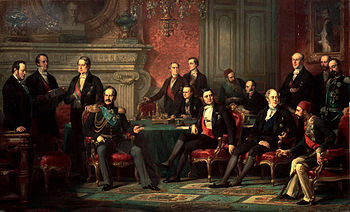 The Treaty of Paris was then signed on 30 March 1856 with Russia on one side and France, Great Britain, Ottoman Turkey, and Sardinia-Piedmont on the other. The group of men negotiated at the Quai d’Orsay.One of the representatives who attended the Congress of Paris on behalf of the Ottoman Empire was Ali Pasha, who was the grand vizier of the Empire. Russia was represented by Prince Orlov and Baron Brunnov. Britain sent their Ambassador to France, who at the time was the Lord Cowley. While other congresses, such as the Congress of Vienna, spread questions and issues for different committees to resolve, the Congress of Paris resolved everything in one group. This entry was posted in Uncategorized and tagged 1856, 25 February, Congress of Paris by admin. Bookmark the permalink.